To reduce incidence of dating violence and increase the likelihood of positive bystander intervention. To enhance core-life and relationship skills among students so they can avoid and/or safely end abusive relationships. To change perceptions about the justice system by increasing knowledge about legal rights and responsibilities. To increase student safety on school campuses. Ending Violence is an innovative dating violence prevention curriculum that puts Break the Cycle's expertise and experience directly into your hands. Ending Violence focuses on dating violence prevention from a law and justice perspective. Content includes basic information about dating abuse in addition to legal definitions, rights and responsibilities under the law and information about accessing the civil and criminal justice systems to protect yourself. The Ending Violence curriculum includes three modules, each of which is sub-divided into distinct, easily presentable units. The DVD also offers a self-guided mode for students to use on their own or supervised. A Spanish-language version of the entire curriculum. 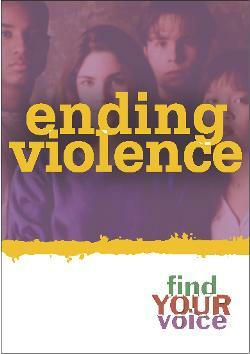 Ending Violence was designed for middle and high school age youth. Depending on your age group, you may want to modify the program to be as relevant and appropriate for your audience as possible. Ending Violence comes with a guide that will help you map out how to adapt the program for the grades you teach. Ending Violence has been used successfully in classroom and after-school settings as well as in alternative settings such as juvenile detention facilities. The program is designed to be easily used by educators, law enforcement, medical professionals, domestic violence advocates and youth service providers. No prior expertise in dating violence is required. Ending Violence incorporates video segments, interactive classroom activities, discussion prompts, animation and opportunities for role plays or extended research projects. This diversity of content and inclusion of all learning styles allows facilitators to engage teens to learn about dating abuse and healthy relationships on multiple levels. The program is divided into three sessions. Each session includes an intro and a wrap-up. Session 1: Dating Abuse 101 — This session provides an overview of teen dating violence. It includes an interactive quiz game called "Yes/No," a segment on the types of abuse, an example of an abusive relationship pattern known as the "cycle of abuse," a segment on warning signs and a segment on obstacles to getting help. Session 2: Domestic Violence and the Law — This session introduces students to the criminal and civil justice systems and explains the legal remedies and protections available. The session introduces students to the story of Robert and Vanessa, a couple in an abusive relationship. The session includes a narrative story, helpful tips on identifying abuse, learning about legal options and a "Test Your Knowledge" quiz to reinforce learning. Session 3: Ending Violence — This session explores the civil justice system remedies to dating abuse as well as important information about staying safe. The segments include tips on getting a restraining order, a mock court hearing, safety planning tips and tools and what teens need to know about building healthy relationships.